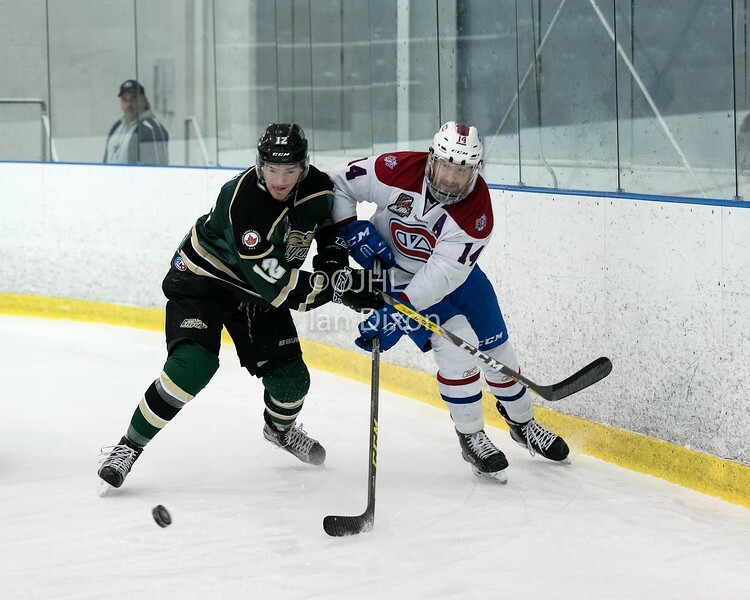 KINGSTON, ON - MAR 9, 2017: Ontario Junior Hockey League, playoff game between the Cobourg Cougars and Kingston Voyageurs, Danny Bosio #14 of the Kingston Voyageurs battles for the puck along the boards with Jesse Baird #12 of the Cobourg Cougars during the 1st period. 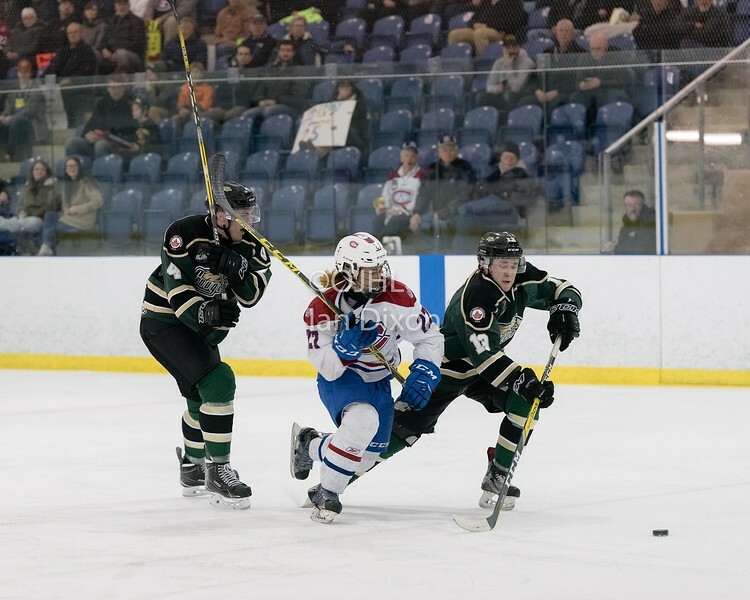 KINGSTON, ON - MAR 9, 2017: Ontario Junior Hockey League, playoff game between the Cobourg Cougars and Kingston Voyageurs, Matthew Bumstead #4 of the Cobourg Cougars makes the hit on Danny Bosio #14 of the Kingston Voyageurs during the 1st period. 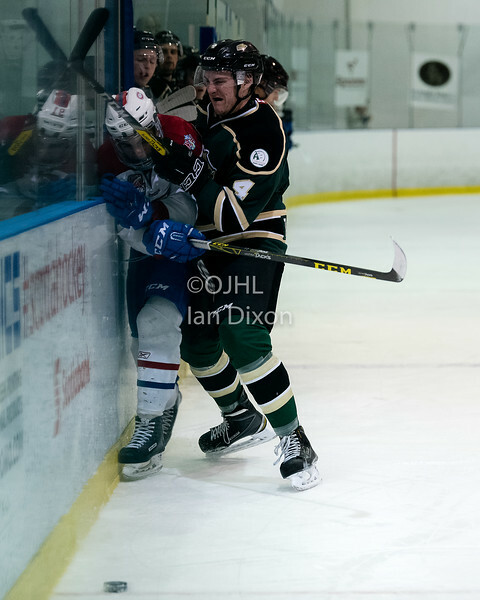 KINGSTON, ON - MAR 9, 2017: Ontario Junior Hockey League, playoff game between the Cobourg Cougars and Kingston Voyageurs, Matthew Bumstead #4 of the Cobourg Cougars makes the hit on Brandon Nadeau #91 of the Kingston Voyageurs during the 1st period. 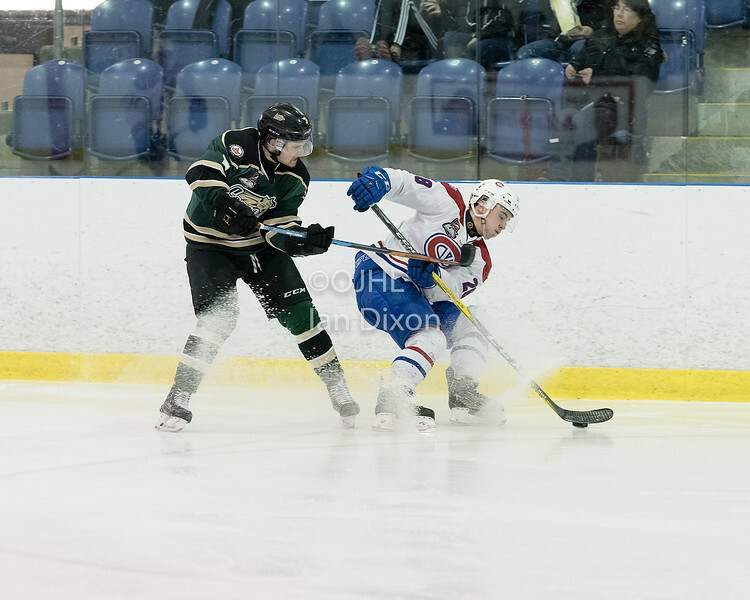 KINGSTON, ON - MAR 9, 2017: Ontario Junior Hockey League, playoff game between the Cobourg Cougars and Kingston Voyageurs, Reade MacInnis #2 of the Cobourg Cougars makes the hit on Danny Reidel #19 of the Kingston Voyageurs during the 1st period. 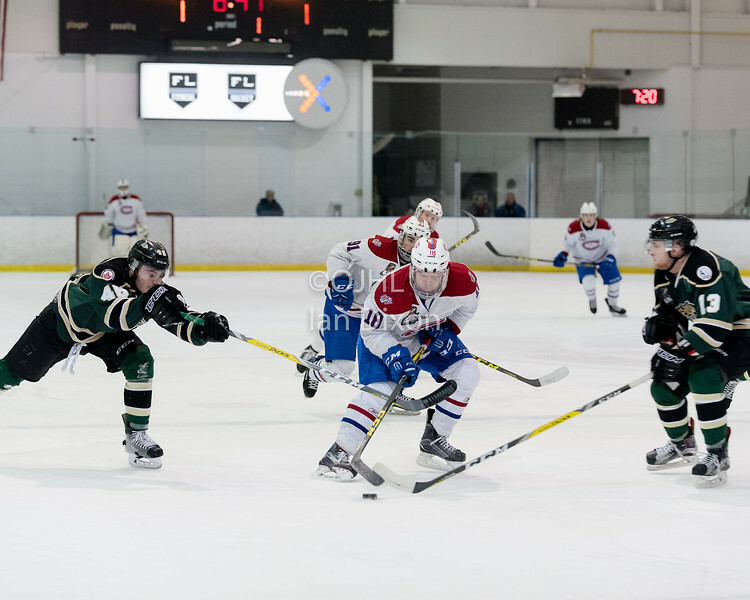 KINGSTON, ON - MAR 9, 2017: Ontario Junior Hockey League, playoff game between the Cobourg Cougars and Kingston Voyageurs, Rob Clerc #18 of the Kingston Voyageurs skates with the puck while being pursued by Mac Lowry #46 of the Cobourg Cougars during the 1st period. 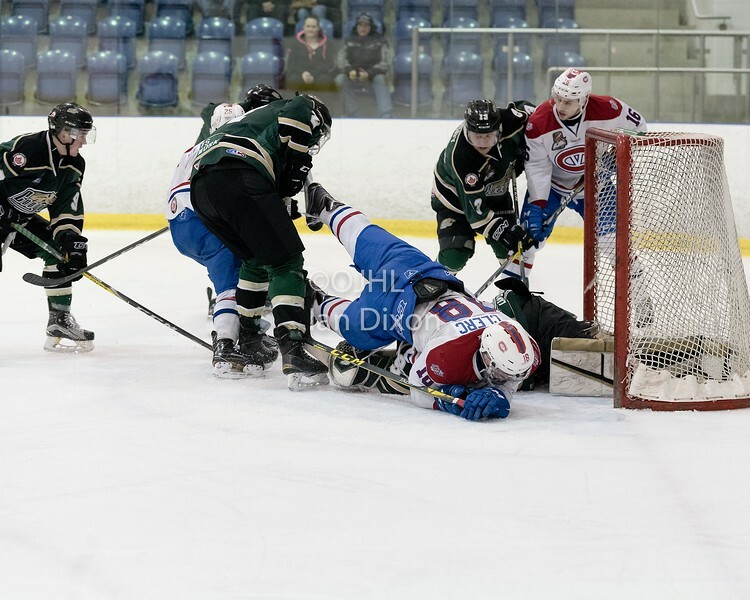 KINGSTON, ON - MAR 9, 2017: Ontario Junior Hockey League, playoff game between the Cobourg Cougars and Kingston Voyageurs, Rob Clerc #18 of the Kingston Voyageurs collides with goaltender during the 1st period. 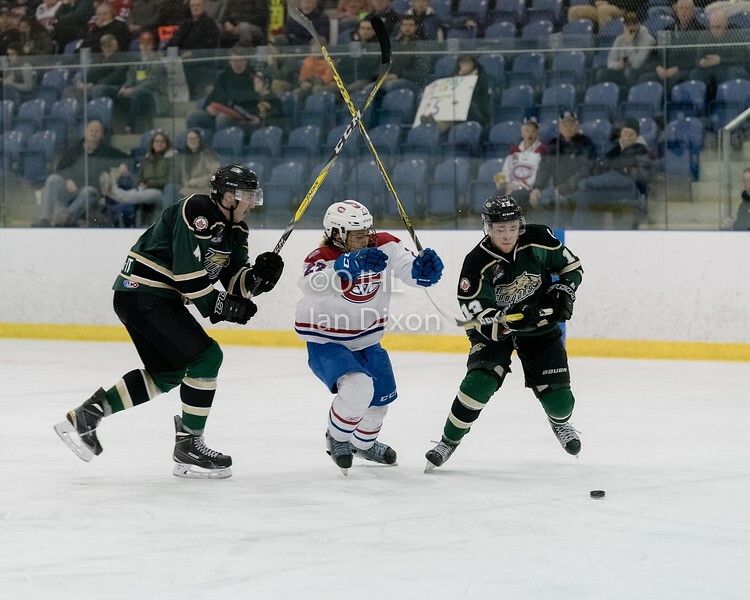 KINGSTON, ON - MAR 9, 2017: Ontario Junior Hockey League, playoff game between the Cobourg Cougars and Kingston Voyageurs, Andrew Suriyuth #27 of the Kingston Voyageurs battles for the puck with Jordan DiCicco #6 of the Cobourg Cougars during the 1st period. 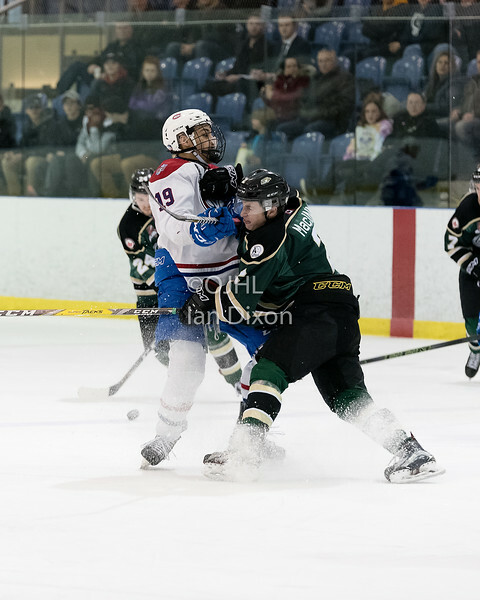 KINGSTON, ON - MAR 9, 2017: Ontario Junior Hockey League, playoff game between the Cobourg Cougars and Kingston Voyageurs, Austin Grzenia #16 of the Kingston Voyageurs avoids the hit during the 1st period. 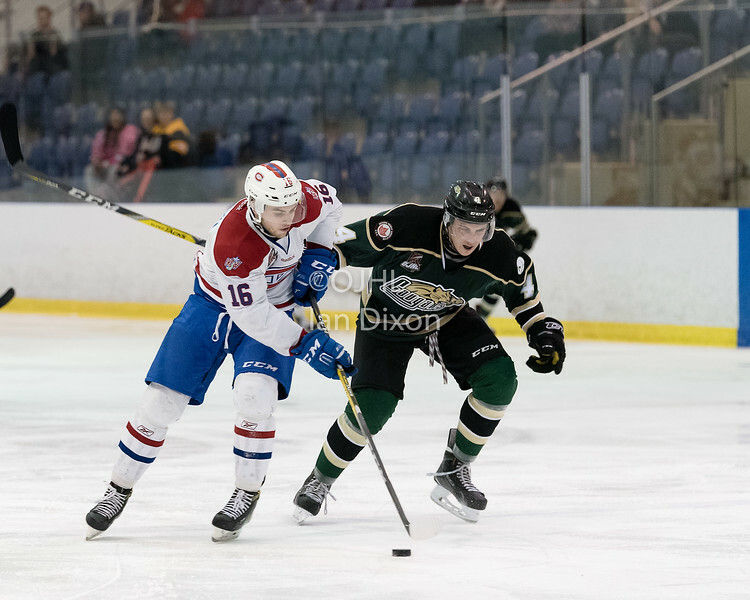 KINGSTON, ON - MAR 9, 2017: Ontario Junior Hockey League, playoff game between the Cobourg Cougars and Kingston Voyageurs, Daniel McKitrick #14 of the Cobourg Cougars battles for the puck with Reid Russell #28 of the Kingston Voyageurs during the 2nd period. 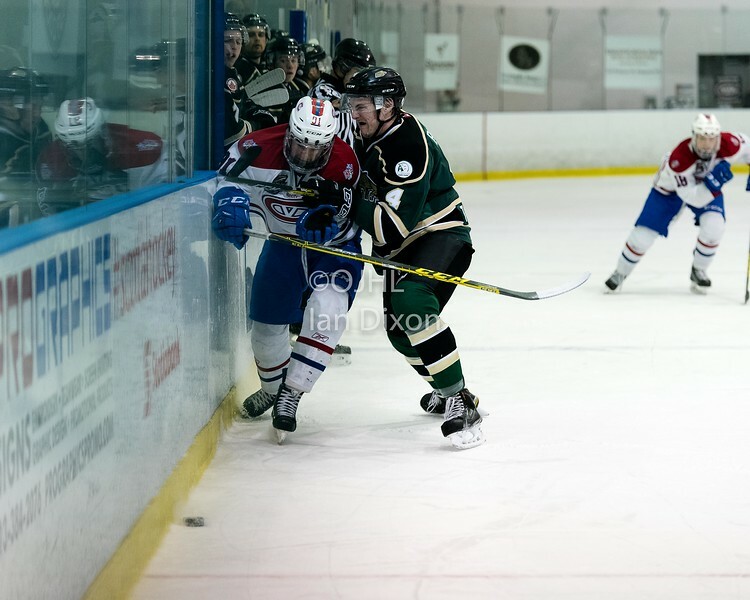 KINGSTON, ON - MAR 9, 2017: Ontario Junior Hockey League, playoff game between the Cobourg Cougars and Kingston Voyageurs, Reid Russell #28 of the Kingston Voyageurs fights to control the puck during the 2nd period. 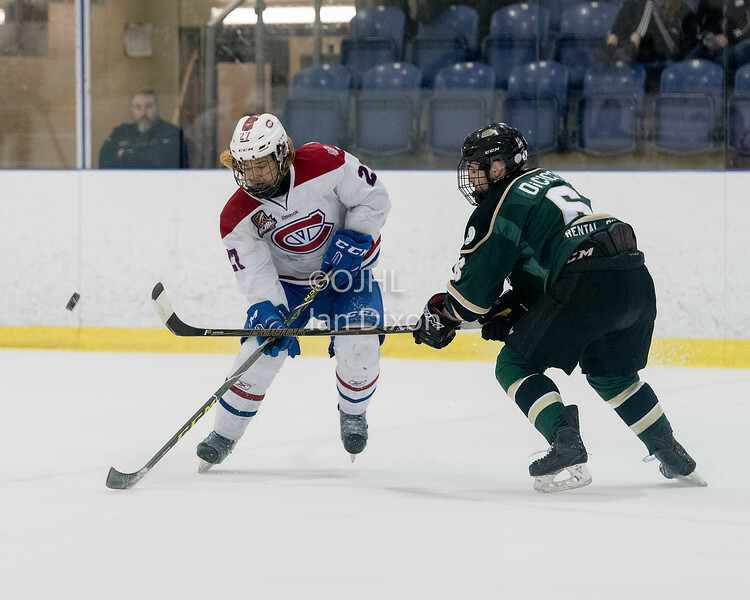 KINGSTON, ON - MAR 9, 2017: Ontario Junior Hockey League, playoff game between the Cobourg Cougars and Kingston Voyageurs, Brenden Locke #17 of the Cobourg Cougars skates with the puck during the 2nd period. 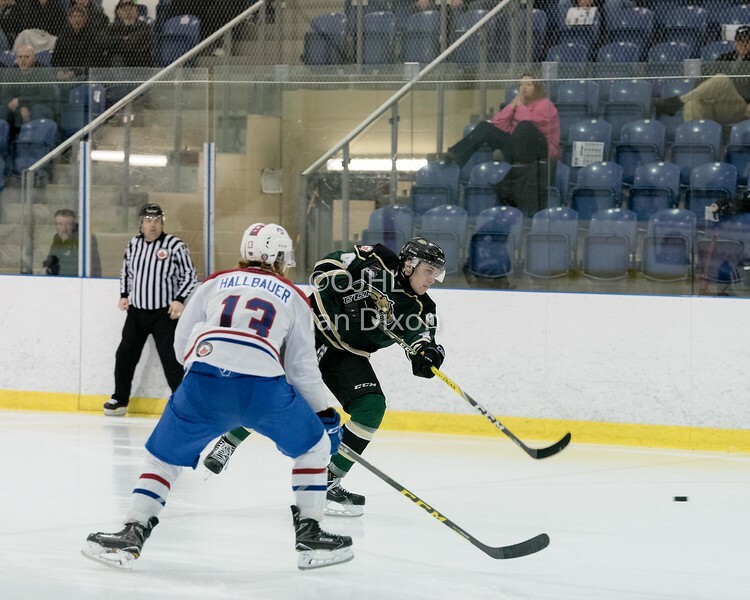 KINGSTON, ON - MAR 9, 2017: Ontario Junior Hockey League, playoff game between the Cobourg Cougars and Kingston Voyageurs, Kyle Hallbauer #13 of the Kingston Voyageurs skates with the puck during the 2nd period. 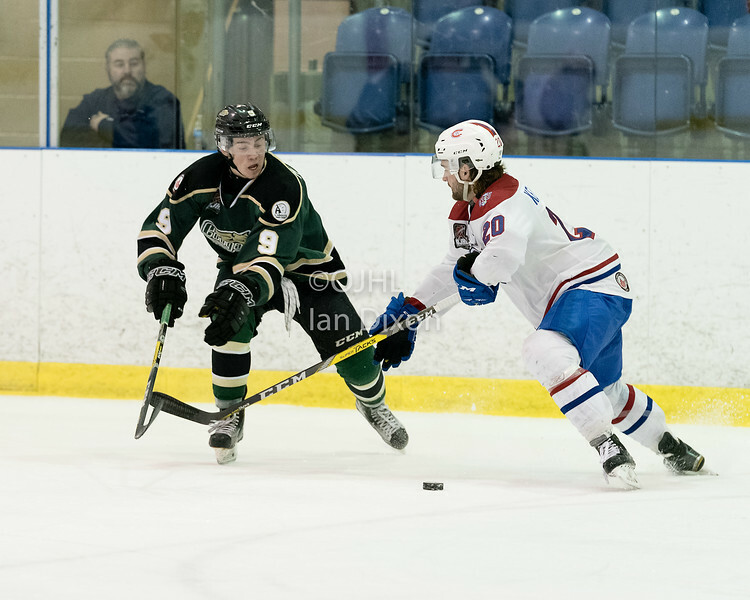 KINGSTON, ON - MAR 9, 2017: Ontario Junior Hockey League, playoff game between the Cobourg Cougars and Kingston Voyageurs,Connor MacEachern #9 of the Cobourg Cougars battles for the puck with Reed Kekewich #20 of the Kingston Voyageurs during the 2nd period. 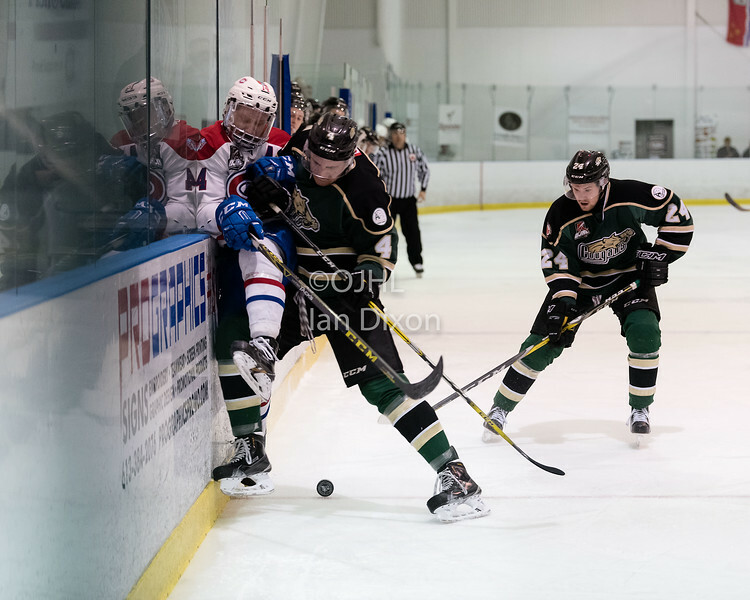 KINGSTON, ON - MAR 9, 2017: Ontario Junior Hockey League, playoff game between the Cobourg Cougars and Kingston Voyageurs, Boyd DiClemente #29 of the Kingston Voyageurs gets a piece of the shot from Jake Bricknell #26 of the Cobourg Cougars during the 2nd period. 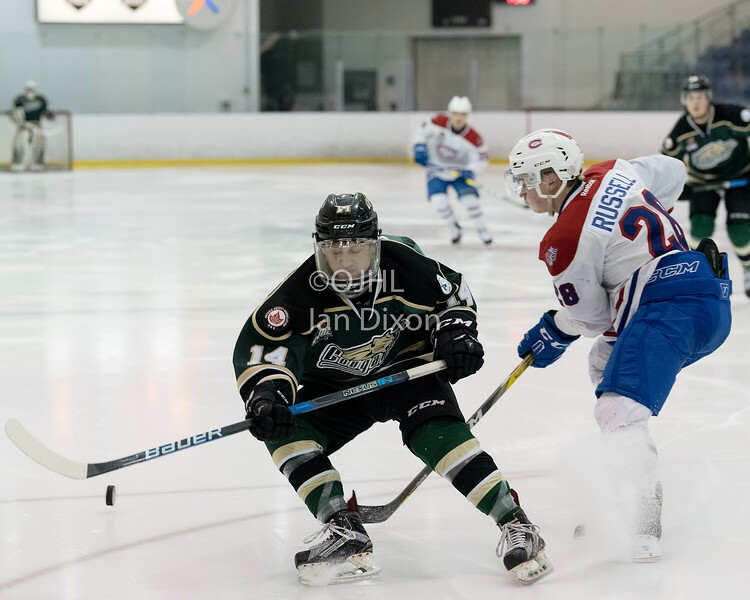 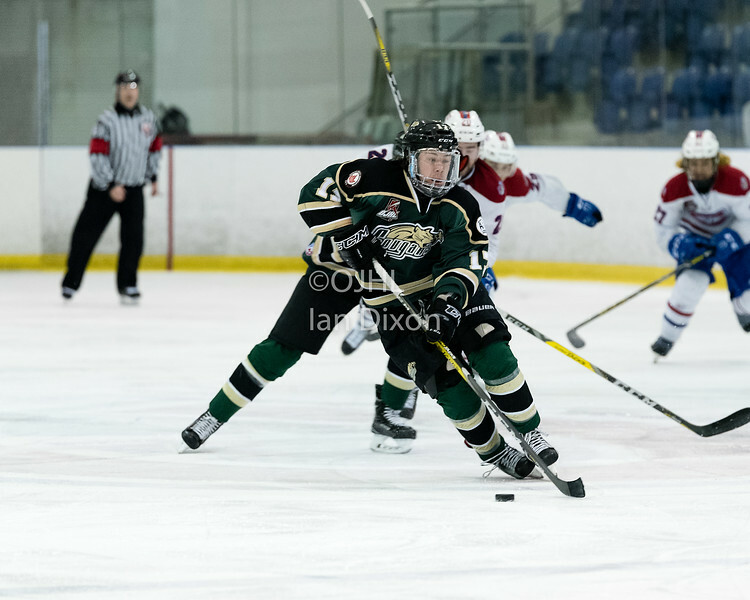 KINGSTON, ON - MAR 9, 2017: Ontario Junior Hockey League, playoff game between the Cobourg Cougars and Kingston Voyageurs, Austin Grzenia #16 of the Kingston Voyageurs skates with the puck while being pursued by Matthew Bumstead #4 of the Cobourg Cougars during the 3rd period. 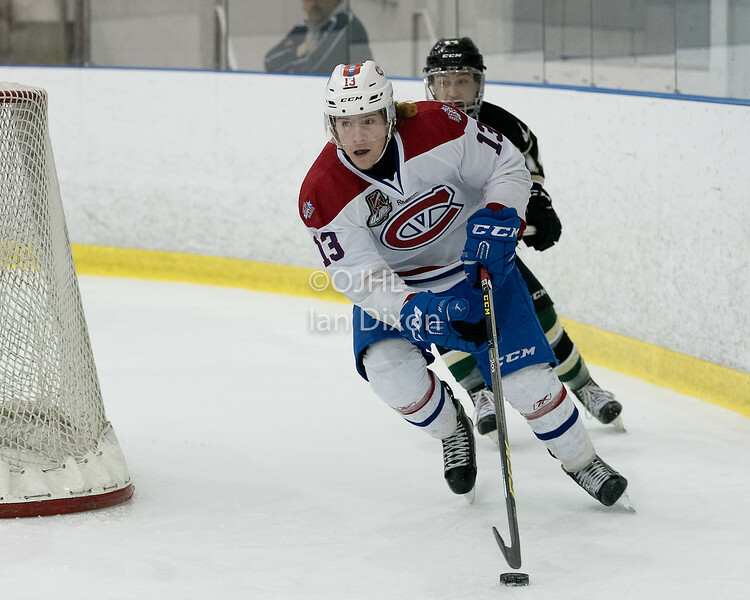 KINGSTON, ON - MAR 9, 2017: Ontario Junior Hockey League, playoff game between the Cobourg Cougars and Kingston Voyageurs, Andrew Suriyuth #27 of the Kingston Voyageurs splits the defence during the 3rd period. 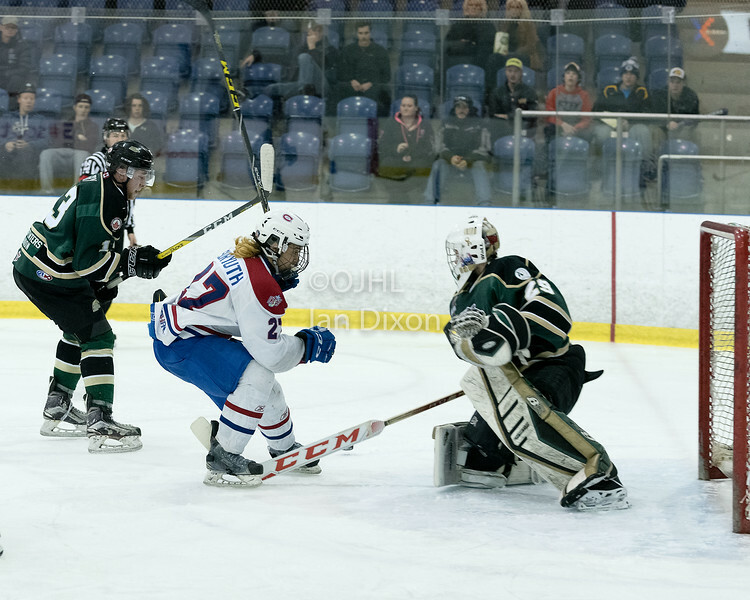 KINGSTON, ON - MAR 9, 2017: Ontario Junior Hockey League, playoff game between the Cobourg Cougars and Kingston Voyageurs, Andrew Suriyuth #27 of the Kingston Voyageurs skates hard to the net during the 3rd period. 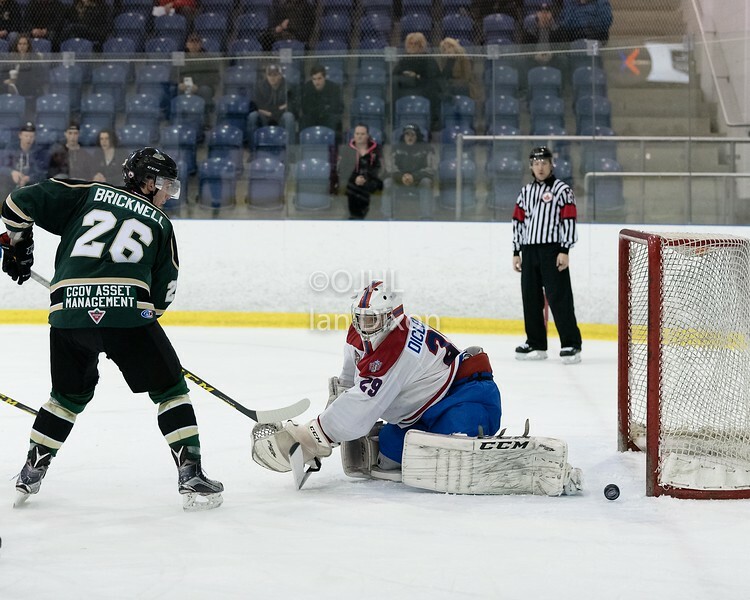 KINGSTON, ON - MAR 9, 2017: Ontario Junior Hockey League, playoff game between the Cobourg Cougars and Kingston Voyageurs, Stefano Durante #29 of the Cobourg Cougars makes the save on Kyle Hallbauer #13 of the Kingston Voyageurs during the 3rd period. 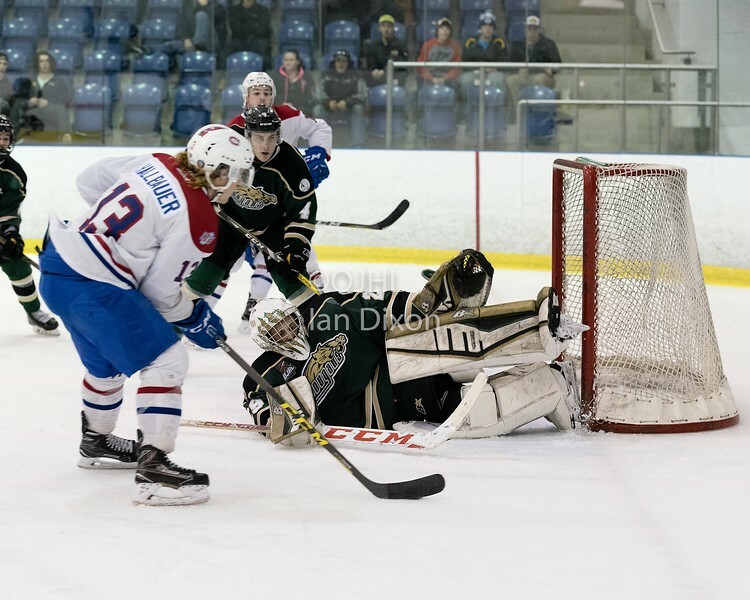 KINGSTON, ON - MAR 9, 2017: Ontario Junior Hockey League, playoff game between the Cobourg Cougars and Kingston Voyageurs, Matthew Bumstead #4 of the Cobourg Cougars scores the winning goal during the 1st overtime period. 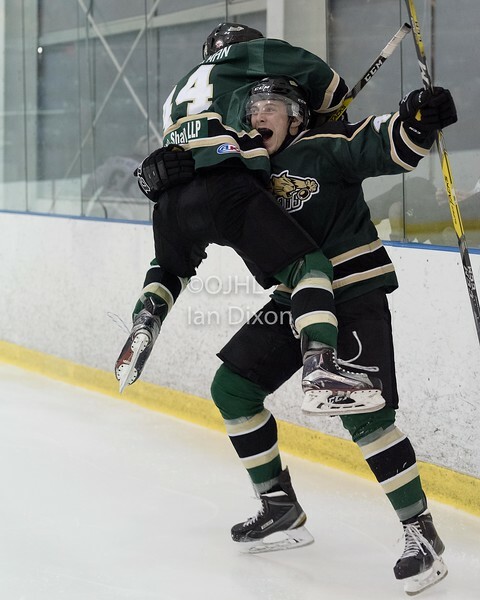 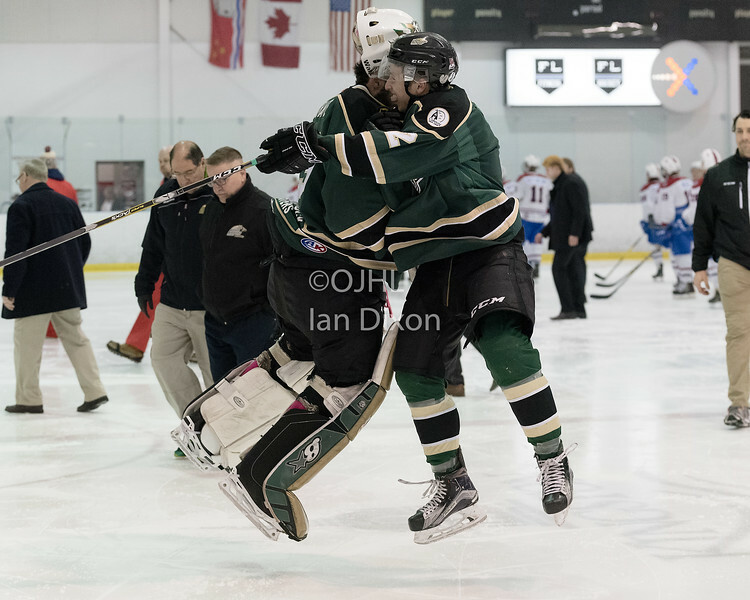 KINGSTON, ON - MAR 9, 2017: Ontario Junior Hockey League, playoff game between the Cobourg Cougars and Kingston Voyageurs, Matthew Bumstead #4 of the Cobourg Cougars celebrates the game winning goal with teammate Ryan Casselman #44 of the Cobourg Cougars during the 1st overtime period. 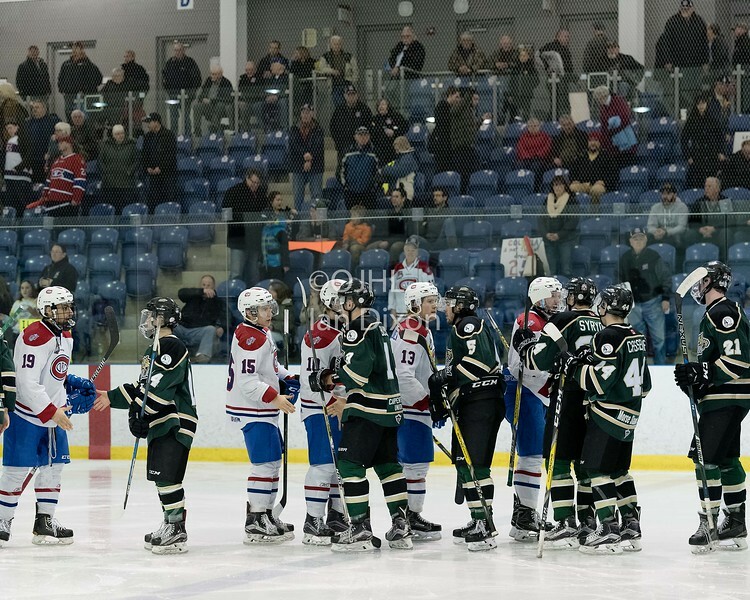 KINGSTON, ON - MAR 9, 2017: Ontario Junior Hockey League, playoff game between the Cobourg Cougars and Kingston Voyageurs, teams shaking hands as Cobourg defeats Kingston. 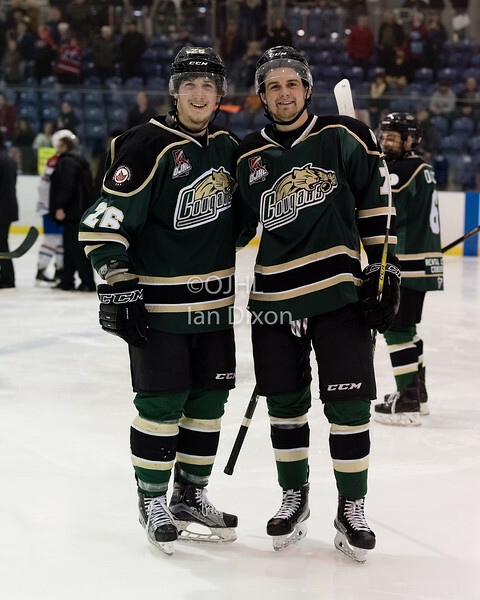 KINGSTON, ON - MAR 9, 2017: Ontario Junior Hockey League, playoff game between the Cobourg Cougars and Kingston Voyageurs, Jake Bricknell #26 of the Cobourg Cougars & Spencer Roberts #7 of the Cobourg Cougars. 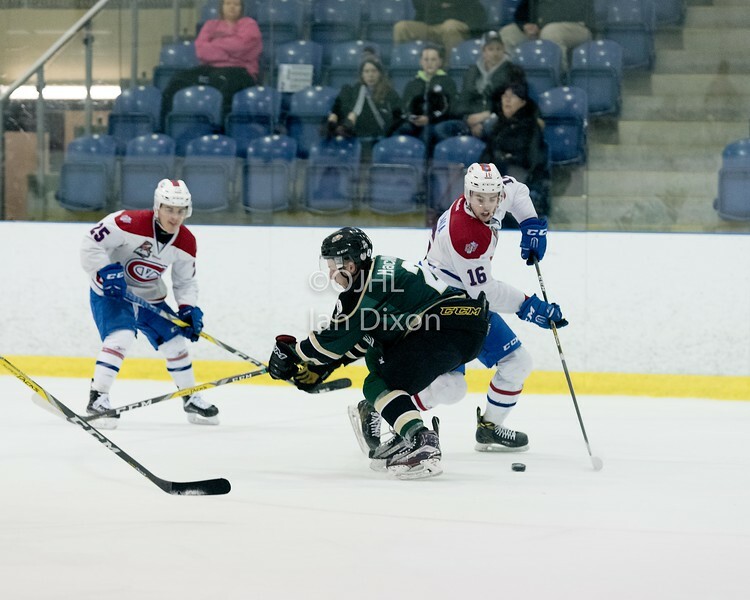 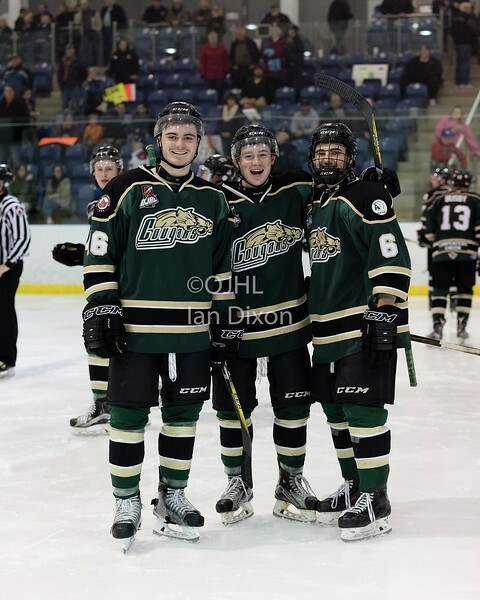 KINGSTON, ON - MAR 9, 2017: Ontario Junior Hockey League, playoff game between the Cobourg Cougars and Kingston Voyageurs, Mac Lowry #46 of the Cobourg Cougars, Connor MacEachern #9 of the Cobourg Cougars & Jordan DiCicco #6 of the Cobourg Cougars. 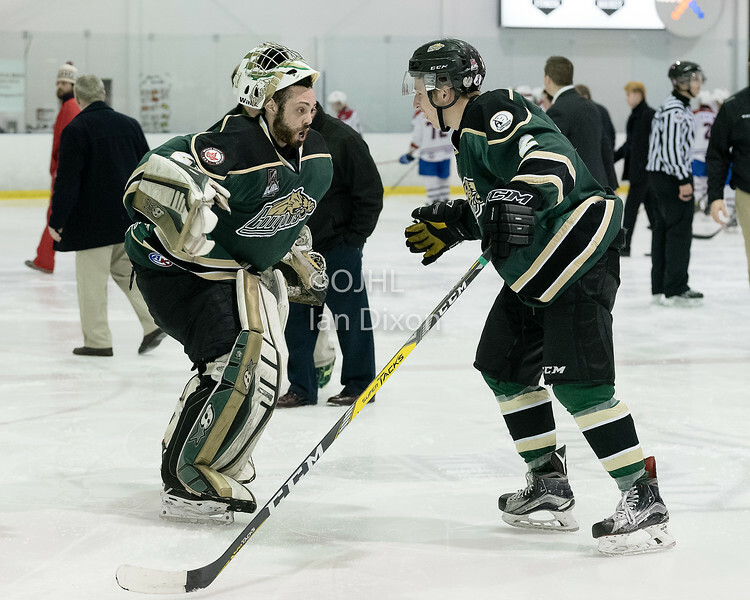 KINGSTON, ON - MAR 9, 2017: Ontario Junior Hockey League, playoff game between the Cobourg Cougars and Kingston Voyageurs, Stefano Durante #29 of the Cobourg Cougars & Reade MacInnis #2 of the Cobourg Cougars celebrate the victory. 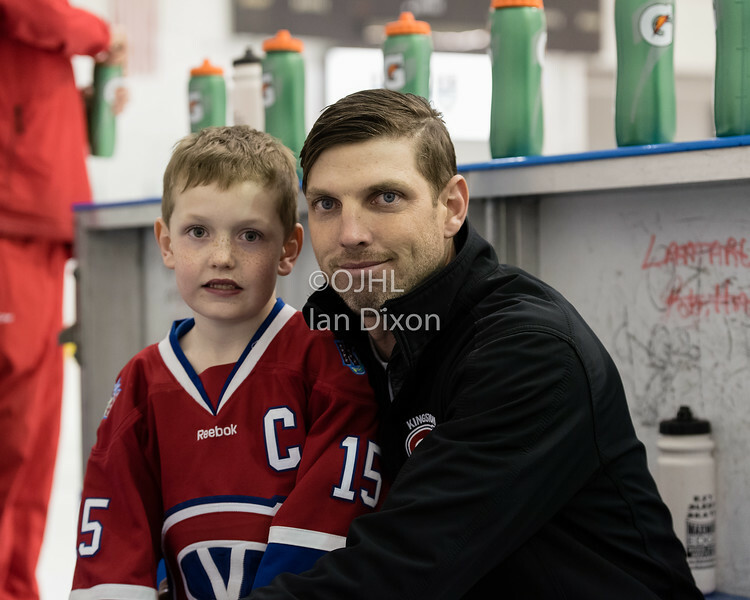 KINGSTON, ON - MAR 9, 2017: Ontario Junior Hockey League, playoff game between the Cobourg Cougars and Kingston Voyageurs, Brooks Taylor Equipment Manager for the Kingston Voyageurs and his son after the game.